What is the “Magic Quadrant”? The magic quadrant is a tool in the form of a chart which enables you to identify and target your community based on voting and library use habits. Using the chart allows you to segregate your community into four main categories, in order to assess your current support base and additional groups you may want to target for support. 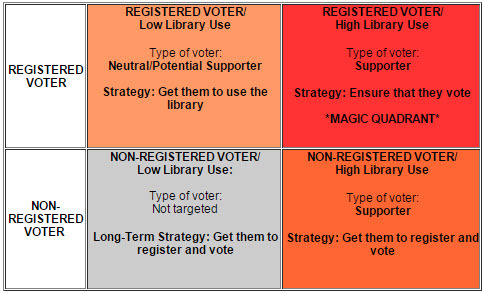 Registered Voter/High Library Use (“THE MAGIC QUADRANT”): easiest targets; they want to maintain or improve services. Ensure that these individuals vote. Consider a strategy that will enable you to move people from the other quadrants into this one. Registered Voter/Low Library Use: Build connections with this group and raise their awareness about the value of the public library within the community. Entice them with programs/services so they will form a favorable attitude toward the library. Non-Registered Voter /High Library Use: Important target group; effort must be made to get them to register. Their votes will really make a difference. They know the value of the library but may not realize how important their vote is to maintaining or improving services. They must be encouraged to register and to cast their votes. Non-Registered Voter /Low Library Use:: It is unlikely that this group will be swayed to vote for the library in the short-term. It is generally best not to direct time or resources to this group during a public vote campaign. However, as part of your library’s strategic planning goals, consider a long-term plan for reaching this group. Obtain a list of voters from your local Board of Elections. Record the number of individuals who fall within each quadrant of the matrix. Consider how you might convert additional Registered Voters/Non Library Users into supporters. Individuals who fall into the category of voters/low library users are candidates for targeted outreach efforts through programs, services, and information. Such activities are likely to convert many of these people into supports, since focus groups with a sampling of these individuals revealed they tend to be unaware of the library’s role and significance to the community. If a positive connection were to be made with them, they are likely to become new supporters. Who is likely to make up this group of voters/low library users? Here are some possibilities.